Italian Ambassador Giulio Terzi: Why are we dedicating so much time and energy to the dissemination of Italian in America? On October 4, 2011, Italian Ambassador Giulio Terzi opened a conference at Georgetown University in Washington, DC, with the following remarks. 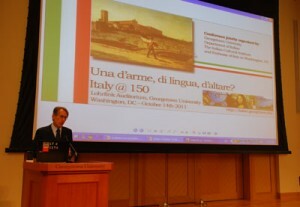 The conference, “Una d’arme, di lingua, d’altare” was held in connection with the celebration of Italy’s 150th Anniversary of its unification. a warm welcome to all of you, and to the distinguished professors who are with us here today – I know that your thoughts on the role our culture and language played in the building of the Italian nation will be most insightful and interesting. My deep gratitude goes to Prof. Laura Benedetti, Chair of the Italian Department at Georgetown University – to whom we owe this wonderful initiative, organized in collaboration with the Embassy of Italy and the Italian Cultural Institute – and to Prof. Serafina Hager. Further, it is particularly fitting that this debate is held at this prestigious University where just a few days ago Prof. Giuliano Amato, Chairman of the Committee for the Celebrations of the 150th Anniversary of the Unification of Italy, held an outstanding lecture – “Celebrating Italy: The lessons of an Anniversary”. The title of this conference: “Una d’arme, di lingua, d’altare”, is no coincidence. This verse [a people who is one in arms, in language, in religion] comes from Alessandro Manzoni’s “Marzo 1821” patriotic poem which is dedicated to his ideal, I would say his irreversible need, for a united Italy. This Conference is also part of the XI Week for Italian Language in the world, an initiative born in 2001 at the behest of the Accademia della Crusca, in cooperation with the Italian Ministry of Foreign Affairs. Learning Italian is becoming increasingly popular in the United. According to the Modern Language Association, between 1998 and 2009 – little more than a decade – students of Italian in American universities rose by almost 60%, passing the 80,000 threshold. The American Council on the Teaching of Foreign Languages reckons that between 2004 and 2008 high-school students learning Italian went up to 78,000, from a previous 65,000. An additional 88,000 people are learning Italian through our local non profit organizations. All this is very encouraging, but there is still an enormous amount of work ahead of us. More Italian in the USA has been the Italian Embassy’s – and the Consulates’ – motto since I became Ambassador to the United States in 2009. The highest Authorities of my Country – to include the President of the Republic, the Prime Minister and the Minister of Foreign Affairs – have often underlined the pivotal role that Italian culture plays in strengthening the friendship between our Countries. And it gives me great satisfaction to say that these calls have been heeded, and acted upon, by those who fully appreciated the great importance of the human and political relations between Italy and the United States. And it is because of this that my sincere thanks go to the Conference of the Presidents of the Major Italian American Organizations, to the Italian-American organizations and to the many individuals who spared no efforts to ensure the success of the project for the dissemination of our language and culture in the US. At the same time, I would also like to recognize all those who daily work towards this goal: the Italian principals, the teachers, the local non profit organizations and, naturally, the students. Last year’s November 10th agreement – reinstating AP Italian – with the College Board in New York bears their virtual signature too, as well as of those who ensured that Italian kept its place among the four most studied languages in the United States. The agreement with the College Board is a step which must be supported further. We are doing this already with the aid of various practical tools, to include the Italian Language Observatory – which includes organizations, professors and teachers – and the interactive portal it has created for students and teachers alike – ussspeaksitalian.org. Both of these are part of a wider picture which includes many interuniversity agreements between Italian and American institutions, such as the one signed by the Universities of Maryland and Perugia, or the MOUs which exist at a State, County or District level for certification of teachers. And now we come the real question – Why are we dedicating so much time and energy to the dissemination of Italian in America? Certainly not only because our language is the essential element of our nation’s culture; above all, because of its richness, strength and modernity. Italian is an essential and founding element of our Country’s unity, both for those who reside there and for those who live abroad. Italy was one long before it became a State. And of the many vernaculars which existed in the 14th Century, one made its way: Dante’s. Through the centuries, his volgare became everyone’s language and, thought it has evolved, it has kept its basic original structure. The language spoken seven centuries ago is still intelligible to all Italians – something few other languages can lay claim to. According to Italian scholar Roberto Cartocci, “ethnos” is what the identity of a people is built upon. One of its main components – “logos”, language is what defines the community. “Logos” played an essential role in “creating Italians” before the Risorgimento succeeded in creating Italy, as a Country. Logos helped to overcome the divisions between people living in the different States and entities in the peninsula. As former Prime Minister Giuliano Amato recently noted, the first teachers in Italian schools were among the “great builders of national unity” – in other words, they helped to make Manzoni’s lyrics – “Una d’arme, di lingua, d’altare, di memorie, di sangue e di cor” a reality. [A people who is one in arms, in language, in religion, in memory, in blood and in heart]. In short, ladies and gentlemen, I am sure this will be a very productive conference and that, above all, it will raise the understanding and appreciation of Italy’s language and culture abroad.